Chutneys are condiments made with fruits, nuts, herbs and vegetables. They add sweet, tangy and/or hot accents to any dish. 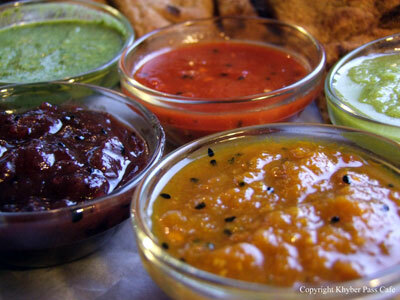 For a more authentic experience, we encourage you to accompany your meal with some of our homemade chutneys. Sweet, tangy and slightly spicy. Fragrant and hot, with sweet notes. Classic Afghani blend, tangy and slightly spicy. Semi-sweet blend with a big bite–versatile & hot!